A patron sits at the bar in Forest Gardens on Forest Avenue in Portland Tuesday. A hand-printed sign, taped to a mirror, reads, "Thank you." 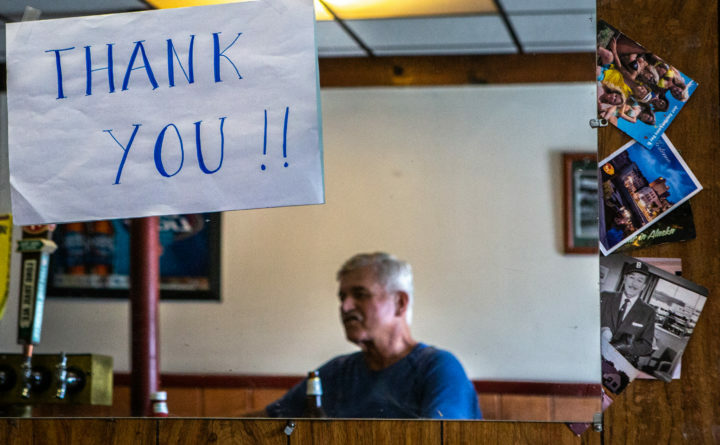 Richard Piacentini, who has owned the bar for 37 years, has sold it. PORTLAND, Maine — The internet rumors are true. One of the city’s oldest bars, Forest Gardens, is closing — but only for a week or so while new proprietors take over. Longtime owner and barkeep Richard Piacentini confirmed the news Tuesday. “I’m done — and that’s the end of our conversation,” said the genial but notoriously media shy Piacentini. Instead of an interview, Piacentini offered this reporter a beer, on the house. It was 11:15 a.m.
Over the course of the gratis Miller High Life, a second one with a deluxe hamburger — at regular price — he did give up a few more details. Piacentini said he bought the bar 37 years ago, in 1981. He also said there’d been a bar in the same spot since 1936. As far as he knows, it’s always been called Forest Gardens, except for a stint in the ’70s when it was owned by a couple of theater professors from the nearby University of Southern Maine. At that time, it was called The Bard, in honor of Shakespeare. Piacentini said he thinks the new owners aren’t planning on changing much, aside from new flooring and a new name for the bar. According to Portland Planning Department documents, the new owner is TRL LLC, owned by Lindsay and Tyler Holden. The duo also owns Atlantic Coast Lending, a home mortgage company based in Gorham. A call to Atlantic Coast lending was not immediately returned. In 2016, a developer wanted to raze Forest Gardens’ block, making way for a CVS. The block also houses a television repair company and a 173-year-old car repair business. Under public pressure, including a “Save Forest Gardens” Facebook campaign, the developer later backed off the plan. 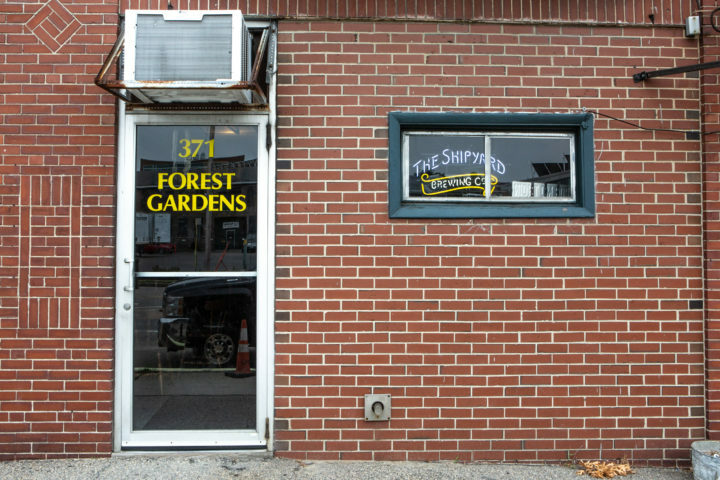 One door and a tiny window mark the location of Forest Gardens, a watering hole on Forest Avenue in Portland. There's been a bar at the same address since 1936. This week, after 37 years behind the bar, longtime owner Richard Piacentiti is selling. As noon approached on Tuesday, the bar filled up with regulars. Judging by the tape measures and paint-splattered work clothes, many were carpenters and painters. Piacentini knew each man by name. He also knew their orders without asking, right down to the specific condiments for their hot dogs. In between orders, Piacentini answered a string of phone calls. Based on the overheard side of the conversations, callers wanted to know if the rumors were true. Was he really selling the bar? Downplaying the importance of his own presence, he assured people the bar would continue without him. Piacentini also told each one that his last regular day of work was Saturday. Online, in the “Portland Maine Encyclopedia of the 1960s, 70s, & 80s” Facebook group, members mourned Piacentini’s departure on Tuesday and shared memories of the bar. Gary Libby said he once saw former New York Yankees manager Stump Merrill at Forest Gardens. “I’ve seen [NFL coach] Mike Ditka there, and I took 1960s folk singer Tom Rush there for a beer during the intermission of his concert,” Libby said. Back at the bar, nobody seemed too worried. Forest Gardens, at least for a few more days, would stay the same. Behind the bar, on the vintage, wood-paneled walls, among countless transparent tape stubs, hung a few handmade signs. One said T-shirts were still for sale. Another reminded patrons that Forest Gardens didn’t take credit cards.